Up to now, there's been no shortage of rudimentary BitTorrent apps for Android, both in the areas of actual download clients (usually pretty poor stuff) and remote managers for desktop torrent programs. But now, downloaders have access to one of the most popular and celebrated torrent clients out there: µTorrent, often called uTorrent or MicroTorrent. The officially blessed BitTorrent client is now available as a beta Android app, downloadable to any Android device running Eclair or later. 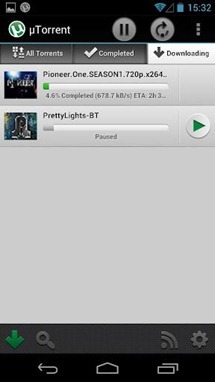 The µTorrent Beta seems to be an updated version of BitTorrent Beta, the official BitTorrent company's app. Both apps (along with the remote managers for their desktop programs) are available on Google Play now. There are no restrictions on download or upload speed, or data file size - anything your phone and connection can handle is fair game. Though µTorrent is marked as beta, there's a lot of features that dedicated BitTorrent users will appreciate, including user-set speeds and RSS support. There is a distressing note on the Play Store page that the app "currently free", so if you think you might want µTorrent later, pick it up now.